Music is my lifeline. That's one big reason I make playlists to accompany some of my books. I've done it for my novels In Shadow, Cherry, and now Tragic Coolness. 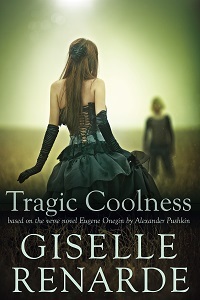 Tragic Coolness is a story about unrequited love. It's based on my favourite opera, Eugene Onegin. A girl falls instantly in love with a guy, but she's horribly rejected by him. Years later he decides he can't live without her. By then, she's married and she's got kids and she's happy... or, at least, she claims to be. I had to listen to a lot of break-up albums to compile this playlist, so I hope you'll have a listen. It's intended to accompany the book, so I guess you'll need a copy. Here are some places where you can buy Tragic Coolness. Where can you find the Tragic Coolness playlist? Music is very meaningful to me, and creating these playlists makes me feel closer to you. I do hope you'll enjoy the songs I've selected to accompany my book Tragic Coolness.